With little prospect of a restart for U.S.-China trade talks, JPMorgan Chase & Co. now expects an escalation in tensions that will see higher American tariffs on all Chinese imports, sending the yuan sliding to its weakest against the dollar in more than a decade. “JPMorgan has adopted a new baseline that assumes a U.S.-China endgame involving 25 percent U.S. tariffs on all Chinese goods in 2019,” JPMorgan strategists including John Normand wrote in a note…. 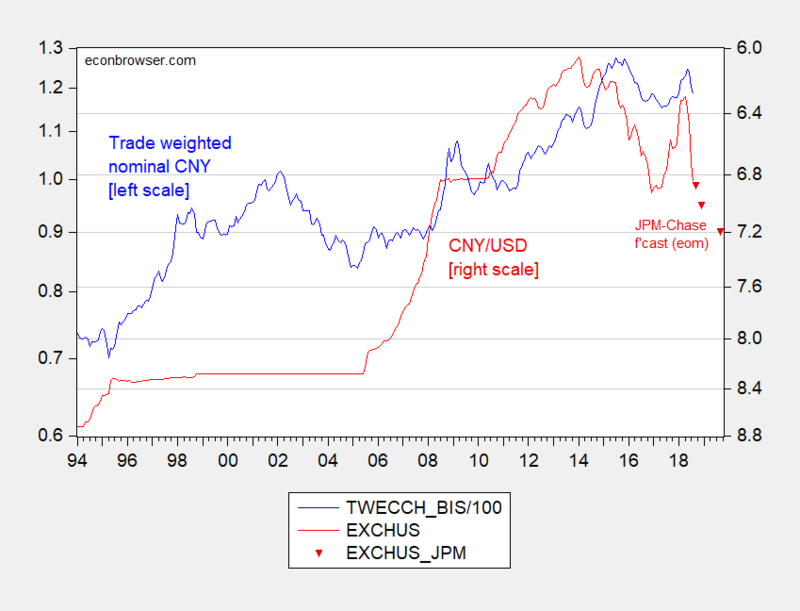 Figure 1: Trade weighted nominal value of Chinese yuan, 2010=1 (blue, left log scale), bilateral CNY/USD exchange rate, monthly average, (red, inverted left log scale). September observation is 9/29, December 2018 and September 2019 observations are end-of-month forecasts from JP Morgan Chase. Source: BIS, FRED, Bloomberg. As the CNY against the US dollar drops, so too might other East Asian currencies. The evidence is mixed — see McCauley and Shu (2018) for a review of the literature. In any case, we can expect the dollar to remain strong partly due to the schizophrenic macro policy mix in the US — expansionary fiscal policy at full employment combined with tightening monetary policy. See Michael Klein’s EconoFact discussion of the forces combining to drive down the CNY against the USD; particularly noteworthy is the point that given this US macropolicy mix and depreciated CNY, the US might not make much progress (if any at all) in shrinking either the reported (and economically irrelevant) US-China bilateral deficit, or the US total trade deficit. This entry was posted on September 30, 2018 by Menzie Chinn. Oh my – a standard application of the Mundell-Flemming model. Those socialists at JPMorgan Chase! Trump is not a free trader, has never been a free trader and never will be a free trader. His UN speech confirm that. His behaviour in office shows also he has no idea of how to get a deal. By only offering ac deal that shows China as a weak and defeated nation his actions are being very charitable uneducated about trade and how large nations react to trading threats. The US has never been held in lower esteem around the world. Currency fluctuations have a greater impact on trade than tariffs. In an era of floating exchange rates the threat of a major trade war could well offset any impact the tariffs may have on the US. We now have a USMCA, NAFTA replacement, agreement. After approval by the Senate, I wonder how that models out for N. Am. and for adding pressure to China to negotiate? We scrape NAFTA in favor of NAFTA II. The ultimate BFD but CoRev thinks this is a game changer. Of course CoRev cannot articulate why it changes anything. Now that we have a USMCA, NAFTA replacement, I wonder how that models out for added pressure for China to negotiate? CoRev Interesting question. My guess is that China will recognize that Trump was desperate to come to some kind of deal because the clock was running out. So the new NAFTA is pretty much the same as the old NAFTA, with a few minor changes. Canada might be a few more gallons of milk from Wisconsin dairy farmers, cars will cost more for US consumers, and businesses will have less long term certainty because of the 6 year review provision. The one good thing to come out of the new NAFTA is that it will implement the digital and intellectual property provisions that Trump opposed in TPP. The Chinese will see how Trump is mainly concerned about showmanship than anything else. Exactly. I wonder if CoRev even has a clue what these minor changes were. I wonder if pgl understands my question: “… I wonder how that models out for added pressure for China to negotiate?“, but his past history indicates it’s unlikely. Your question is your usual gibberish. Pardon me for ignoring what you always do – write gibberish and expect us to bow down. Pgl, I see you running away again without supporting even another assertions.. I see you emoting again, without providing any logically connected remarks or supporting references,. I also see you failing to write a coherent sentence. In other news, the sun came out this morning. 2slugs, weren’t you claiming just a few days ago that the US/Mexico bilateral deal was dead? Not only not dead but expanded. He’s got you guys so buffaloed its hilarious. CoRev That’s exactly why Trump was so desperate to get to something that looked like a deal. That’s the lesson that the Chinese will take away from this. It’s the story of Trump’s life; he’s cares more about making a deal than what’s actually in the deal. The “deal” is basically something that all three countries could have agreed to months ago without all of the tariff nonsense. It’s the kind of “deal” that allows each country’s political leader to declare victory while leaving consumers in each country slightly worse off than they were before. The only people who are being buffaloed (is that akin to being “boofed”?) are the usual MAGA hatters who think NAFTA 1.01 is what Trump promised in 2016. But that’s okay because what Trump promised was godawful, so if the MAGA hat crowed is fooled (yet again), I guess that’s a small price to pay. BTW, reports are that the aluminum and steel tariffs are still in place. The market response today is based on the hope that NAFTA 1.01 signals a relaxation of the aluminum and steel tariffs. So after all this mayhem that Trump created, if the tariffs are removed we’ll end up pretty much where we were before he started all this nonsense. Lots of pain for no gain. 2slugs claims: ” The “deal” is basically something that all three countries could have agreed to months ago without all of the tariff nonsense. ” Then contradicts: “BTW, reports are that the aluminum and steel tariffs are still in place.” precisely! Most reports claimed it wasn’t the US but Canada who delayed all three countries from agreeing months ago, and tariff leverage was their reason for delaying. The tariffs are still there, and Canada is still part of the trilateral NAFTA Replacement agreement. The reason tariffs were implemented are still there to be solved. Your assertions are no more than personal opinions without support. If the anti-MAGA crowd is fooled (yet again), I guess that’s just another example of being buffaloed. Consumers being slightly worse off depends if those consumers have been advantaged by the total economic policy. What amazes is the slight given to the workers getting increased wages in all three countries. Why are Dems almost always wrong or waving a flag over one area (consumer prices of limited products) while ignoring the bigger picture of families/consumers having more to spend? “rules of origin for automobiles (meaning a certain percentage of parts have to be manufactured in each country to avoid tariffs) as well as new digital trade rules, intellectual property protections, and strengthened labor rules”. John Harwood read this new NAFTA and he noted the only significant changes related to the new digital trade rules. Of course these changes were worked out back in 2016 by the Obama Administration according to Harwood. Not no exactly new and not something Trump pulled off. So WTF does this have to deal with our trade war with China? Not a damn thing! Pgl: “So WTF does this have to deal with our trade war with China? Not a damn thing!”. Clueless again, I see. Another set of finished products will no longer be provided by China. Remember question was adding pressure to China to negotiate? CoRev and tariff leverage was their reason for delaying. That sounds like the usual Fox Noise tradition of getting a complicated story all wrong and dumbed down for its viewers. The fact is that Canada dragged its feet because it wanted to retain the dispute resolution process established in NAFTA 1.0. That dispute process is what Canada has used to protect its lumber industry. It didn’t have a damn thing to do with “tariff leverage.” Trump realized that his back was up against the wall, so he agreed with Canada’s demand to keep the NAFTA 1.0 trade dispute process intact. In return, Canada agreed to allow somewhat larger US dairy exports; however, dairy was never part of NAFTA 1.0, so this “concession” was really kind of a sideshow. As I said, everything in NAFTA 1.01 could have been agreed to long ago. And the one good part of NAFTA 1.01 was negotiated under Obama and was a provision that Trump originally opposed. So yes, you’ve been buffaloed. Your assertions are no more than personal opinions without support. No, I did some research. Try going beyond Fox & Friends and Newsmax. Huh??? Please explain to us how higher tariffs and domestic content laws give families and consumers more to spend. I guess that’s MAGA-Hat “thinking”. 2slugs,, you confirmed you do not understand the bigger picture since Trump took office, consumers have been advantaged by Trumps total economic policy. Your need to give credit to Obama is amazing: “And the one good part of NAFTA 1.01 was negotiated under Obama…” but never went anywhere. Try implementing! Sorry, CoRev, but consumers have not been “advantaged” by Trump policies, and certainly not by his trade policies, which have raised prices for many consumer goods. As it is, teal median wages have not risen since Trump became president, indeed, have declined slightly because rising inflation has swamped increases in nominal wages. You do not have your facts right. How was I “wrong” about the trade agreement. It does damage living standards for US consumers, period. July real median incomes do seem to be rising, but real median wages did not do so over the past year. Non-wage income has risen. did it really change nafta? or was it simply a political name change with a few updates? have not heard the details yet. baffling: I think it’s best described as Nafta 2.0 (or better Nafta 1.5). I often the PATH take train to New Jersey which has these word puzzle games. I wonder if they will run USMCA this week. If so, I’ll shout out NAFTA. Not true. The Marine Corps are now in charge of US trade. interestingly, it appears the the revised nafta agreement has provisions in it for strengthening labor unions, especially in mexico. i do find it fascinating that we have republicans in the usa who are most definitely anti-union and anti-labor, preferring to keep the power structure controlled by management and capital, supporting these pro-union and pro-labor aspects for mexico in the revised nafta agreement. i just wonder why they are good policy for mexico, but not the usa? at any rate, i think it is good that we have an agreement in place for trade with two of our largest partners. i simply wish we could avoid the drama. the cost of the simple revisions to nafta was overpriced-we could/should have done it much cheaper. but i do question whether the next mexican president won’t simply do the same thing, and walk out of the agreement demanding a renegotiation-just like trump. i do find it petty that trump demanded the name change for and agreement that is simply a revision. i bet if somebody submits the obamacare documents to him, but renames it trumpcare on the coverage, he will promote it immediately. Not long ago, Repubs were gagging at the prospect of a $15/hr. minimum wage in certain states by, what, 2023? My God, that will be ruinous! No can do! But let the crowing begin over this deal’s certain higher minimums……in Mexico! $16 an hour for a Mexican assembler of automobile components as the NAFTA II minimum wage but shock and charges of socialism when Hillary proposed that US workers get $12 an hour. Just weird. One question – in the non-union South (e.g. Alabama) how much do U.S. auto workers get per hour? I’m sure it is well below UAW expectations. Pgl, the South? Try MI in UAW country. Speaking of how things have changed. In the CA CD 10 election, Republicans are accusing the Democratic candidate of being a CAPITALIST (a “Bay Area Venture Capitalist” to be exact). Sadly for Hillary Clinton, she never found a truth she perceived as better than any lie within reach of a 3 mile fishing net. That’s how she ended up telling lies you hear from a 5 year old. Hillary got so accustomed to hearing herself lie, the sound of truth became abnormal and perverted to her ears. Sorry Professor Chinn. You got this one wrong. NAFTA 1.01 is the correct nomenclature. P.S. Quit stealing by thunder. Your troll union membership dues check should be sent to my home address. There are still a few hurdles before (NAFTA 2.0) USMCA becomes a reality. John Harwood just told us that NAFTA 2.0 does have a big improvement over old NAFTA is how it deals with the digital economy. Before Trump takes a bow he should note that Harwood noted these improvements were negotiated when Obama was President. OK – maybe this is why CoRev thinks this will make China buckle. I guess that was his question above. But I still contend his question re China was nothing more than his usual meaningless banter. Of course John Harwood – who knows a lot more than CoRev does – did note that the most substantive change had to do with the rules for the digital economy, which were negotiated by President Obama. Look we know CoRev gets everything wrong but can his ignorance of the real world be more apparent than this?! Let’s be clear – the new domestic content rules that YOU were harping as a game changer will put no pressure on China as they do not sell us that many finished cars. Lord CoRev – do you even remember what you wrote earlier? I guess you have joined Kavanaugh in the 100 kegs of beer club. Pgl, “finished cars”???? Only you moved to this position when the issue discussed was auto parts/auto content. Do you even own a car? What has been happening in the auto industry is that a growing percentage of parts are manufactured by Chinese owned firms. Many are US-based and use former US facilities. The AFTER MARKET parts are gradually being overtaken by Chinese suppliers out side the US. Pgl and most forget a secondary goal of the tariffs is to keep or add manufacturing in the US. forget free trade. you are promoting protectionist policies. and they are hurting the future of autos, such as electric vehicles, as tesla can attest to. you are protecting old manufacturing at the expense of the future of manufacturing. silly. Malibu door handles! LOL! Hey CoRev – I documented using census.gov how much we imported in 2017 from China in terms of finished cars (a mere $2 billion) or components ($18 billion). Peanuts in terms of the size of this sector or what we buy from Mexico and Canada. Seriously dude – try actually READING and doing a little real research before you embarrass your mom with this off the wall nonsense. I guess we need to make this simple for CoRev. What this is saying is that the total cost of making cars in North America would rise relative to the cost of making cars in Asia or Europe. Which likely means Americans will buy less from Ford and GM and more from Volkswagen and Toyota. Pgl again shows his ignorance and need to respond to things he does not understand. In a comment thread talking about AUTO PARTS, he responds with: “CoRev thinks the new NAFTA’s domestic content rules will limit the imports of cars made in China that are imported into the U.S.” Pgl, please stop! You are totally out of step with reality. (30000) Passenger cars, new and used; and (30100) Trucks, buses, and special purpose vehicles combined, we see that the U.S. imported over $210 billion of these goods in 2017. From China? A mere $2 billion. And to think CoRev is all alarmed at how many cars we import from China. Seriously? And to think Pgl is all alarmed at how many cars we import from China. Seriously? When we were talking about auto parts/content value within an auto. FYI clueless wonder. Ford and GM source components from Mexico and Canada. Yes Toyota sources components from China. I’m beginning to wonder if you have any clue how cars are even manufactured! Did you ever even get a driver’s license? CoRev flip flopped on this car thing – first saying it is about “finished product” but now saying he is talking about components. Never mind he has no clue what the domestic component clauses in old and new NAFTA even say but could he have checked end user codes in that Census link from 30110 to 30230? Who am I kidding – CoRev has a serious aversion for actual facts. Fine. I just did and we imported a mere $18 billion of components. As usual – CoRev has no clue what the topic even is. Nor a clue what he himself wrote a few minutes ago. But could he once ¬– just once in his babbling and incoherent life – check one single fact? DAMN! Well, the two documents won’t match exactly. It turns out that Team Trump renumbered the paragraphs from the original NAFTA 1.0. So change the name, renumber the paragraphs and blather about dairy stuff that was never in NAFTA. That’s the MAGA-Hat Way. And yes, they’ll fall for it every time because they saw it on Fox & Friends. Then again ObamaCare was originally RomneyCare. Which Romney wanted to “repeal and replace”. Replace with what – Romney had no idea. and the dairy part of nafta 2.0 is basically what we would get if we had not pulled out of the tpp. i guess the tpp was a failure, until he plagiarized that as well. team trump should be turned into the dean of students for a lecturing on ethics and honesty in claiming others work as his own. so tesla is demonstrating the “winning” aspect of the trump trade wars. in response to the tariffs caused by the current trade wars, tesla is ramping up construction of its shanghai factory, expecting to produce 500,000 cars per year within 5 years. too bad those cars won’t be manufactured here in the states. but trump has effectively closed off the largest electric vehicle market to us manufacturers with the trade war. now i know the oil, coal and gas fanatics on this blog will argue who cares, because electric cars are beneficial to global warming, which they do not believe is occurring. but the future of transportation is electric, and our president is keeping our top companies outside of a fast growing global market in the name of the trump tariff and “winning”. and the presidents’ actions are encouraging china to protect, invest and grow its own manufacturing and technology sectors. what a stooopid policy by our president. And the dairy “concession” is little more than a pittance at a whopping $70M more than under TPP. Yep, Trump sure is a master dealmaker. Months of antagonistic rhetoric with our closest friend and neighbor all for something that could have been achieved at far less cost. What an idiot. California’s Dairy/Dairy Products exports for 2016 were a bit over $1.4 Billion. Top five export destinations: Mexico, Canada, China/Hong Kong Phillipines, Japan. The state’s share of that extra $70 Million should be a bonanza. Who knows? With all that extra cash rolling in, maybe the undocumented workers on the Nunes dairy farm- the one in Iowa– will get raises. baffling, what would be a better and wiser policy? The Tesla Shanghai plant will take years to be online, it seems. tesla says it will produce in a couple years, with 500,000 annually in five years. we ramped up the timeline (i say we because in full disclosure, i own tesla stock) because of the current tariff situation. it is simply too costly to import the cars into china at this time. first off, simply do not introduce a policy which creates these incentives in the first place. tesla could have had several years of full production and import of cars from the us into china-using our own manufacturing facilities and workers-had we not gotten into the trade war. that is income here in the states, to run our economy, which is now lost. not a wise choice. couple that with this being an emerging-and possibly game changing technology-and you simply invited a foreign country to capitalize on your own innovations. trump actually has encourages exactly what he is trying to reduce with his china tariffs. no need to replace a policy, sometimes its better to simply not create a poor one to begin with. Perhaps this could give a glimpse of what the type of possible endgame Trump team are looking for. some countries could simply take the view, that by the time this could become an issue, trump will be out of office. Any policy is double-edged sword and needs be evaluated globally. It’s clear Trump and the hawks are trying to induce a new equilibrium. This is the usual intellectual garbage from CoRev. Minor point – Barkley was not commenting on USMCA – he was commenting on whether consumers are paying lower prices (CoRev’s position) v. higher prices (reality). Major point – there was no deceit about the fact that real median wages have not risen as they have not. CoRev does not dispute this. He just says there could be a variety of reasons for this fact. Of course Barkley never gave a singular reason – he just stated a fact. Of course this is what CoRev ALWAYS does. I hate to call people trolls but in this case he clearly behaves like one way too often. Of course this is what pgl ALWAYS does. His normal behavior is misrepresenting what others have said (what he just did) when he is not rudely baiting and taunting others. I suppose it might just be over compensation. Only he knows. I see – the tax cuts received by the Hampton crowd makes up for the extra they will have to spend on cars. Tell that to the average Joe who got a tiny tax cut and paying a lot more for goods. I’d love to see how Joe takes your Trumpian rear end to the cleaners. Hint – make sure you are near a local police man before taking Joe on! once again, corev, your response is simply incoherent. your comments and argument simply make no sense-which is why you get so many befuddled responses. This is CoRev’s idea of proof that median real income is soaring? Forget the red line in the graph as nominal comparisons over time are meaningless. Inflation – hello? The blue line is inflation adjusted. Real median income is BARELY higher than it was in 2000. 18 years later. Yea – it took a major hit as a result of the Great Recession which occurred when Bush43 was President. It recovered a lot during the Administration of some dude named Obama. And somehow CoRev thinks this proves Trump’s policies are GREAT! Can one get dumber? Oh wait – what was CoRev’s comment? Yes – he can get dumber! CoRev Sorry, but you’re just wrong. Your first mistake was in relying upon calculations done by Political Calculations. See the note inside the graph? Your second mistake was in not understanding the source of the data. The BLS does not compute median income by month. They do estimate mean income by month, but not median income. So those median numbers are based on Political Calculation’s own guesstimating. Your third mistake was in failing to understand that the median income data is not done by BLS, but is the joint product of the BLS and Census Bureau. Your last data mistake was in not knowing that median income data is expressed in terms of weekly wages, not annual wages. To determine how much the real earnings of a typical working American fell during that period, simply adjust the $876 in median weekly earnings in the quarter ending June 30, 2018, for the 3.32 percent inflation that occurred in the 18 months from the first quarter of 2017 to that date. The result: $876 in June 2018 had the same value as $848.20 in January 2017. In real terms, the weekly earnings of a typical working American fell $16.80, or 1.9 percent, during Donald Trump’s first 18 months as president. Before adjusting for inflation, median weekly earnings increased during Obama’s last 18 months from $803 in the third quarter of 2015 to $849 in the last quarter of 2016. People’s average weekly earnings thus increased $46, or 5.73 percent, before adjusting for inflation. Over the same months, cumulative inflation from July 2015 to December 2016 was 1.12 percent, so the real earnings of a typical working person clearly increased. By how much? Adjust the median weekly earnings in December 2016 of $849 for the 1.08 percent inflation over the preceding 18 months, which comes to $838.82. In real terms, the weekly earnings of a typical employed American increased $35.82, or 4.5 percent, over Obama’s last 18 months in office, growing from $803 in the third quarter of 2015 to $838.82 in the fourth quarter of 2016. Great detail documenting what Barkley had told CoRev. So how does CoRev respond? Accuse Barkley of being misleading. Pointing out the facts is misleading? Oh yea – it contradicts what Team Trump wants us to think so ergo it has to be misleading. And it so it goes with CoRev 24/7. Looks like Mexican workers will do quite well under the new agreement. Better wages, improved employee benefits, more collective bargaining. We should watch closely. If successful there, no reason we can’t try it here. it is nice that the conservatives have decided to protect the working class. of mexico. too bad they don’t extend that courtesy to american workers. i have yet to meet a conservative who supports collective bargaining and labor union rights in the united states. A two-year-old factory near Kansas City gives a good look at China’s strategy for becoming a global force in autos … The Riverside, Mo., plant’s operator is controlled by China’s No. 1 auto maker, but the factory doesn’t build cars. Its about 200 workers assemble door handles, center consoles and other parts that ship to a nearby General Motors Co. factory, which fits them into Chevrolet Malibu sedans. The Coalition for a Prosperous America is the nation’s premier nonprofit organization working at the intersection of trade, jobs, tax and economic growth. We are a bipartisan coalition of farmers & ranchers, manufacturers and labor groups working for a national strategy to eliminate the trade deficit, create good paying jobs and deliver broadly shared prosperity to America. Huh – their focus was not on Chinese owned car companies. But CoRev gets all worked up over door handles made in the good old USA! The poor dude gets more and more confused by the hour! CoRev is confused about a lot of things. Has been for a long time. He still thinks it was a good idea to invade Iraq. And I think we can guess how many times he voted for Richard Nixon…’nuff said. 2slugs, what a fascinating discussion. Most wage earners aren’t economists and don’t adjust their weekly checks for inflation. They do, however, do the simple comparison of before to now. Using your BLS data, before means the last Obama quarter, and the now is the latest check, where the median weekly wage has increased by $33 or $1700+ annually. They did notice that ~4% raise in pay since Trumps election. The other thing those poor deplorable wage earners also noticed how many of their friends and family were able to find jobs in that same 7 quarter period versus Obama’s last 7 quarters, 3.120M versus 4.149M. My comment was that consumers and families were advantaged under Trump. Trying to dispute the values of those advantages is an interesting study in economics, but we’re talking about wage earners in an article about China’s end game with tariffs. A little off topic don’cha think? To be clear I am a skeptic about the certitude of nearly all Government numbers, and referenced a paper a few weeks ago to support that position. I ‘m curious, in your zeal to correct me did you actually compare the sources to determine the differences? CoRev demeans the working Joe for being too stupid to under real versus nominal. Amazing. Look CoRev – you write stupid gibberish 24/7 we get that. But even the kid flipping Big Macs gets this simple concept. Yes some 16 year old fast food employee knows more economics than our CoRev. He very ably articulates what Friedman and Phelps were saying noting workers DO INDEED take into account how the prices of goods they buy are changing. I can only imagine the ridicule that Friedman, Phelps, or Lucas on anyone writing such an incredibly stupid line. CoRev but we’re talking about wage earners in an article about China’s end game with tariffs. A little off topic don’cha think? Perhaps, but you were the one who initiated this detour with your comment about families being “advantaged” under Trump. I simply corrected your error. It’s a thankless job, but someone has to do it. Most wage earners aren’t economists and don’t adjust their weekly checks for inflation. So no rational expectations when it comes to wage earners??? And I am even more skeptical of people who comment on economics but can’t be bothered to read an econ book or learn basic statistics. 2slugsm wrong again. “Perhaps, but you were the one who initiated this detour with your comment about families being “advantaged” under Trump.” Look back and see who and what that was in response. “Rational expectations”? Again using en economic specific term when the point was that “wage earners” are rational even though not economists when they notice that nearly 4% increase in pay and most have more take home because of the tax cuts. CoRev: Please, please, please, for the love of gawd, you’re commenting on an economics blog, so at least please understand what rational expectations means. Menzie for heavens sake get off your high horse! “The rational expectations theory is an economic idea that the people make choices based on their rational outlook, available information and past experiences. The theory suggests that the current expectations in the economy are equivalent to what people think the future state of the economy will become” The highlighted portion is what I have exemplified. It is the economists here who are having trouble with understanding. Pgl thinks that Mickey Dees 16 YOs apply inflation adjustments to their pay checks before spending them. You folks have been wrong about Trump and his policies and continue to miss the obvious. USMCA will pass. CoRev: OK. I’ll just say John Stuart Mills and the Classicals (as in the Classical economists) would be disappointed in you. You are, by the way, arguing for “money illusion”. Never knew you were a closet Keynesian. How workers form expectations can be debated but you are guilty of what Menzie properly called “money illusion”. Which is a kind way of saying you have accused workers of being as incredibly stoopid as you are. Most economists think workers are at least a wee bit smarter than not to realize that consumer prices could be rising. God – what a dumbass statement. All one of these employees has to do is to walk into the lobby and check the current price of a Big Mac. I guess you are too stupid to do that but every worker I ever met does know how to check to the price of the goods they buy. Menzie, and I thought you were so sure you knew me? “Never knew you were a closet Keynesian.” Why not? corev, we have gone down this rabbit hole before. take a minute and look up rational expectations theory in a textbook-or even wikipedia. your stance on the quote above indicates you do not know what rational expectations theory is, but you think you know what it is by interpreting rational expections in your own unique way. by the way, my experience is using investopedia to learn economics is not a particularly good approach. looking back, i think many economists may agree using the term “rational” in this theory creates a misunderstanding for most populists in the world today-and leads to the confusion you seem to have. Oh good grief. You are basically saying workers look at nominal wage increases without even thinking for a moment – what happened to the prices of goods. I provided a link to a 1972 paper written by Robert Lucas for you. Clearly you have not read it but you really need to as you are making the dumbest argument of all time right now. Listen CoRev – maybe you are this incredibly stupid but most workers do consider expected inflation. This is the most basic concept ever on modern macroeconomics. Oh wait – you have no clue what macroeconomics even means. Pardon the interruption. Please babble on! this is an economics blog. the purpose of such a blog is to eliminate ignorant populist understanding of the science of economics, so that we actually understand the facts on the ground. you are promoting the idea of “alternative facts” with your commentary. i would think the blog owners would take issue with that on their blog. hence your comment “My comment was that consumers and families were advantaged under Trump.” appears to be innaccurate, or of the “alternative facts” family. but when dear leader claims he has the largest inauguration audience in history, even with photographic evidence contradicting the statement, you accept it without question? rather hypocritical, don’cha think corev? As also in: Obama employment data was inflated, inaccurate, and the product of liberal fantasies. Trump data: as honest, understandable, and correct as if it it came directly from God via St. Larry Kudlow. Mike “I’m a Christian and you’re not” Pence whines about the politics of China’s approach to trade wars? At the Hudson Institute think tank, Pence said China was using its power in “more proactive and coercive ways to interfere in the domestic policies and politics of the United States.” “China wants a different American president,” Pence said. The intellectual garbage! I guess Pence wants to duck the fact steel tariffs were all about getting the votes of steel workers. He may claim he is a Christian but he is simply dishonest to the core. if you notice, some commenters on this blog are quite interested in changing the way china operates their economy. apparently it is ok for the us to interfere with domestic policies and politics of china, but not the other way around. i am speaking of folks like peaktrader and corev on this issue. rather hypocritical, don’cha think?